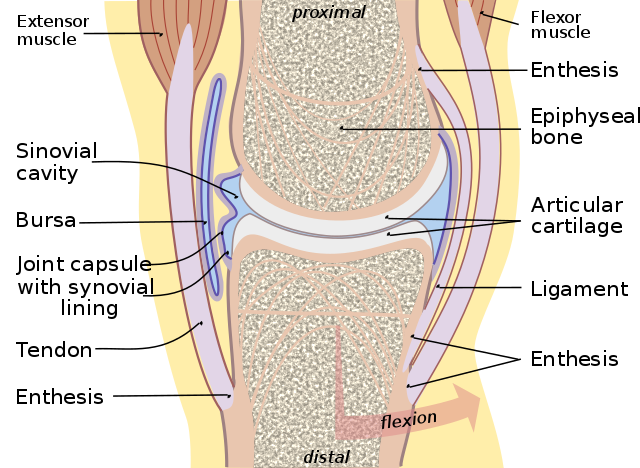 A joint or articulation (or articular surface) is the location at which bones connect. The point where two components of a structure join, but are still able to rotate. This rod is free to swing at the joint with the platform. The point where two components of a structure join rigidly. The water is leaking out of the joint between the two pipes. (anatomy) Any part of the body where two bones join, in most cases allowing that part of the body to be bent or straightened. The means of securing together the meeting surfaces of components of a structure. The dovetail joint, while more difficult to make, is also quite strong. Set the joint in a roasting tin and roast for the calculated cooking time. The part or space included between two joints, knots, nodes, or articulations. (geology) A fracture in which the strata are not offset; a geologic joint. (originally slang) A restaurant, bar, nightclub or similar business. SLA (always with "the") prison. I'm just trying to stay out of the joint. After locking the door and closing the shades, they lit the joint. VT To unite by a joint or joints; to fit together; to prepare so as to fit together. VT To join; to connect; to unite; to combine. VT To provide with a joint or joints; to articulate. VT To separate the joints; of; to divide at the joint or joints; to disjoint; to cut up into joints, as meat. VI To fit as if by joints; to coalesce as joints do. Done by two or more people or organisations working together. The play was a joint production between the two companies. Follow-up X-ray examinations demonstrated excellent congruity of both the radio capitellar joints and the humeroulnar. The deposition of urate crystals in the joints leads to gout. Meaning of joint for the defined word. Grammatically, this word "joint" is an adjective, more specifically, an uncomparable adjective. It's also a noun, more specifically, a countable noun. It's also a verb, more specifically, an intransitive verb and a transitive verb.